I absolutely LOVE the blog world! I love the friendships I've made. I love connecting with other mamas. 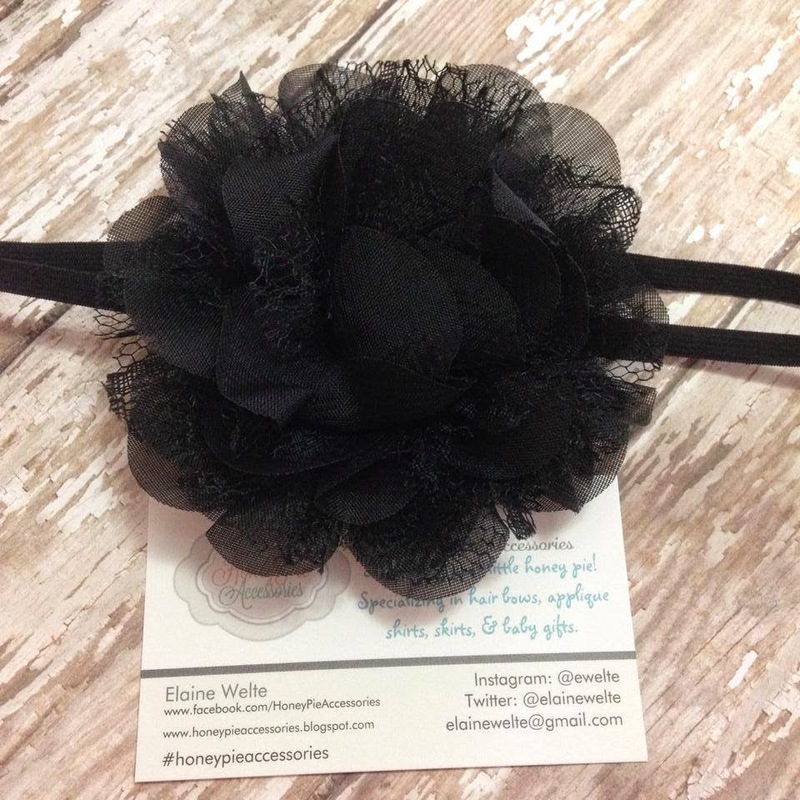 One of those sweet mamas I've met is Elaine over at Honey Pie Accessories. Elaine and I went to the same college at the same time and have never met in real life!! But...we've connected through the blog world! Crazy, huh?? Elaine is a wife, mommy to three adorable little girls, speech pathologist, AND she is the owner of Honey Pie Accessories. Elaine makes the cutest one-of-a-kind shirts for any occasion!! 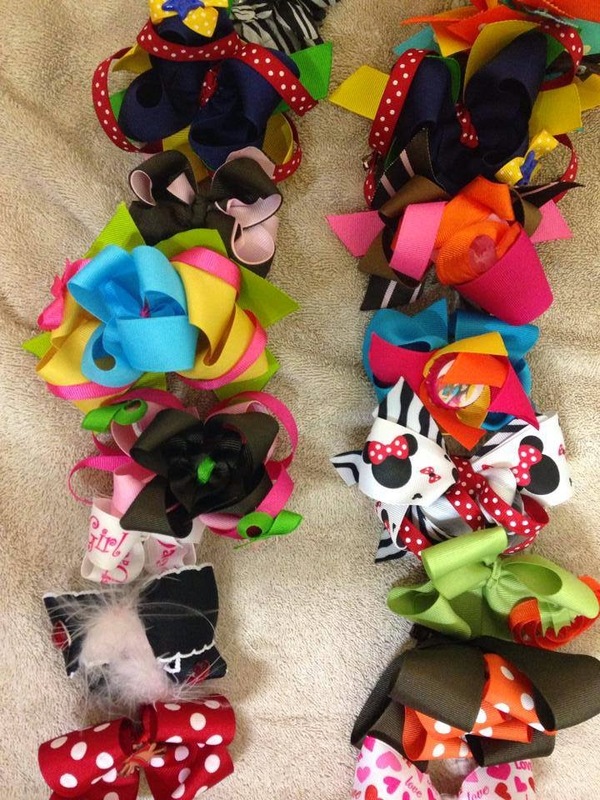 She also makes adorable bows, super cute baby gifts, and so much more!! Elaine has so generously offered to giveaway ONE APPLIQUE' SHIRT-WINNER'S CHOICE!!! Keep reading...the rafflecopter is at the bottom of the post. 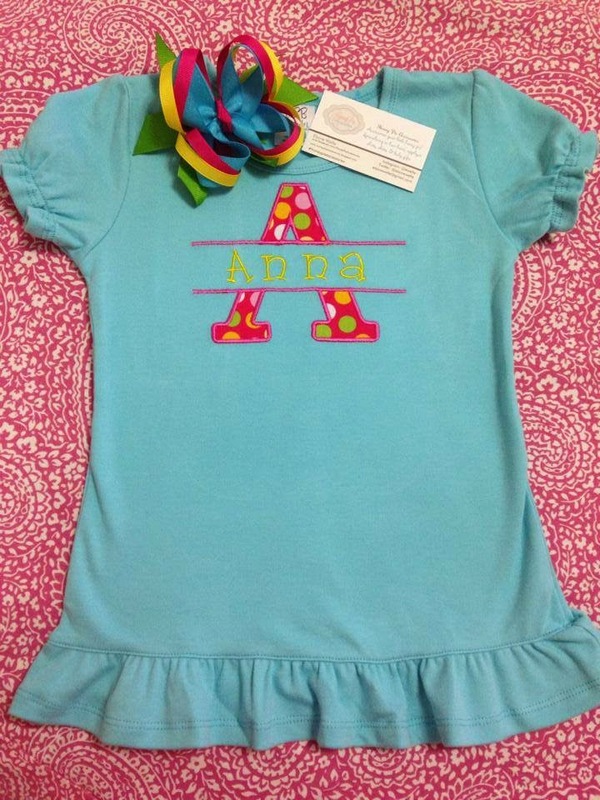 Elaine made this adorable shirt and matching bow for Ebby Lee. Isn't it cute?? (Again, insert me crying in the corner because she's going to KINDERGARTEN in a couple weeks!! But...thanks to Elaine...she'll look GOOD when she goes, right?) She has a TON of other back-to-school designs on Facebook AND some adorable fall designs too!! Photo bomb by the little brother!!! hahaha! LOVE this top and the matching bow!! A close-up...this is how we roll (in the background) in the Slaughter house...tee, diaper, and tennis shoes! haha! After I took a couple pictures, I told her to take it off and she can wear it when school starts. This is her begging to keep it on. :) She LOVES it, Mrs. Elaine!! Super cute tank for school!! 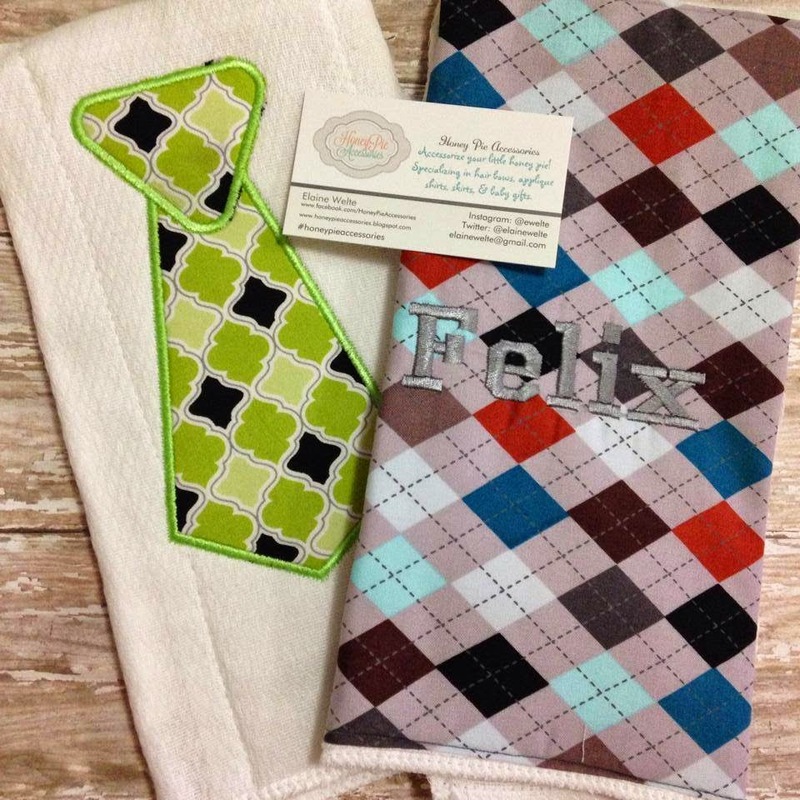 Adorable burp cloths...the perfect baby gift!! This headband is great for fall!! 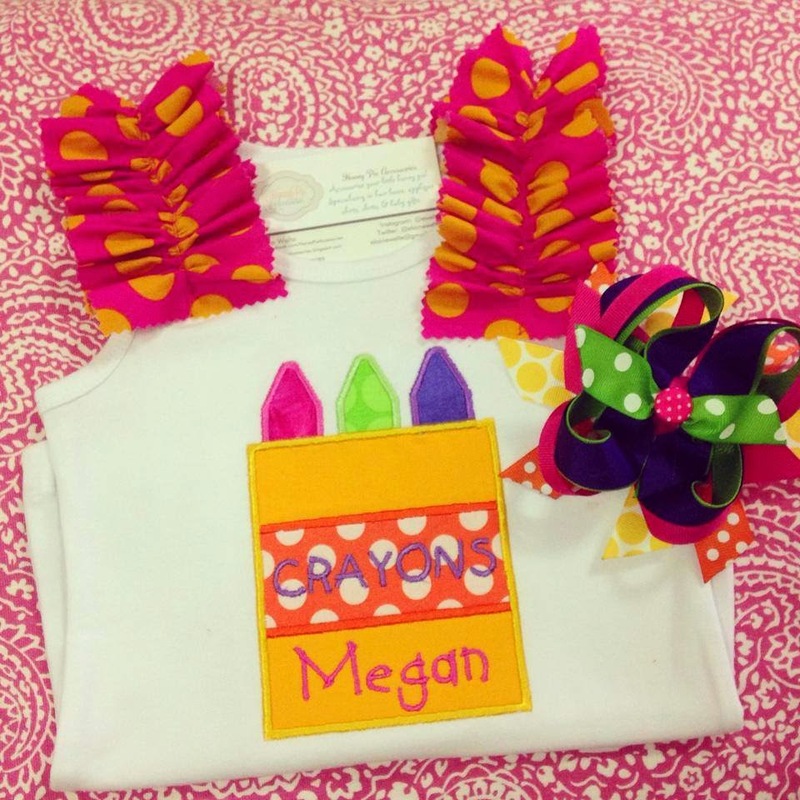 Another cute little top and matching bow...perfect for back to school! Check out more of Honey Pie Accessories goodies on Facebook HERE. Follow HPA on Instagram @ewelte. Or...check out Elaine's blog HERE. ALSO...Honey Pie Accessories is offering all of my readers 15% off your entire order with the code "littlebitofeverything15"!! If you want to place an order, please message Elaine directly on Facebook and add the code to your message!! And...right now Honey Pie Accessories has fall "product test" shirts for only $18.00! That's a STEAL!! How stinkin' cute is Ebby Lee in those pictures?!?! Eeks! Adorable!!! So, so sweet!! I love it!! Adore the tie burp cloth! Will have to purchase that for my sister! Super cute shirt on Ebby Lee!!! I love anything monogrammed!!! Ebby Lee will have a great time in kindergarten, and look adorns while at it! Can't wait to see who wins! Ahhh, what adorable stuff...LOVE it all!!! SO fun and cute!! Fingers crossed!